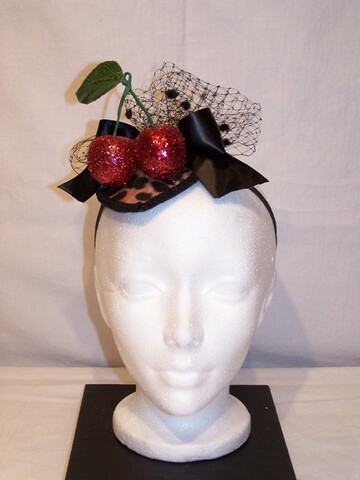 This super cute fascinator was made by me with the thought that it would be perfect for a burlesque performer and that is exactly who purchased it! She is a lovely gal who performs with an Ottawa based burlesque troupe and is planning to wear it on stage, if she hasn’t already. This was my first attempt at producing a three diimensional image from nothing to be placed on a hat and I was quite thrilled with the results. 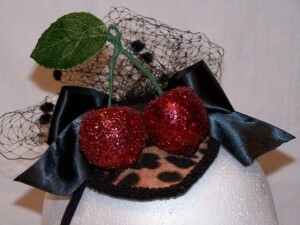 Love the glitter and leopard print…..so burlesque and pin-up! This was an exciting sale for me as one of my desires and goals is to create costumes and accessories for the stage. theatre and in my wildest dreams…movies! 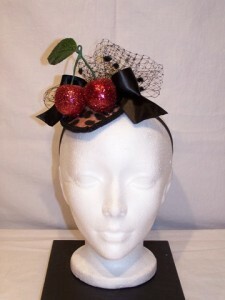 There has been some mention of perhaps hiring me to design costuming and accessories for some of the troupe’s shows now that they have met me and seen my ideas and capabilities. They may even be interested in a rental arrangement for commissioned pieces from me. Keep your fingers crossed for me…and toes for good measure. I’ve never actually seen anyone who can cross their toes…anyone, anyone? This artwork was inspired by something my pastor said. In one of his messages, he said that God sees us as a “beautiful mess”. This struck me, hard. It mirrored how I feel sometimes. I am a mess but, God views me as a beautiful mess. I am dear and precious to Him no matter how much I have messed things up. I had made the fairy wings as part of a costume for myself years ago and they were hanging on the wall of my studio collecting dust. 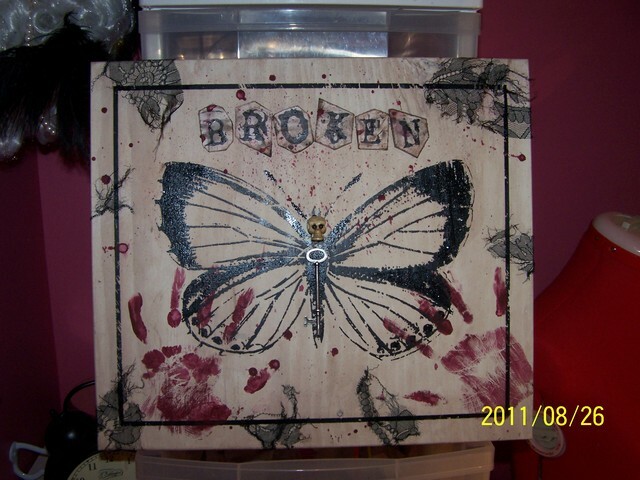 I purchased a canvas that I distressed a bit, printed out the lettering and mounted the wings to the canvas. It hangs on a wall in my bedroom. When I see it each morning as I start my day, it serves as a reminder to me of just how imperfect we are and yet how perfect we are in God’s eyes, faults and all. Thank you, God. And thank you, Rob for giving me this insight and as a result, this piece of artwork to enjoy and receive hope from everyday. 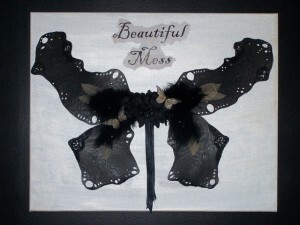 This altered artwork was created for a dear friend. I was truly touched when asked to make him something to hang in a place of honour in his new workshop. I found the basis for the piece at a big box store. It was a wooden box/frame that already had the butterfly and border painted on it. It was significantly reduced in price and thrown an the area for those pieces no one wants. As soon as I saw it, I knew it was exactly what I wanted. I could already picture the butterfly with a skull added to it and the word “broken” above it. 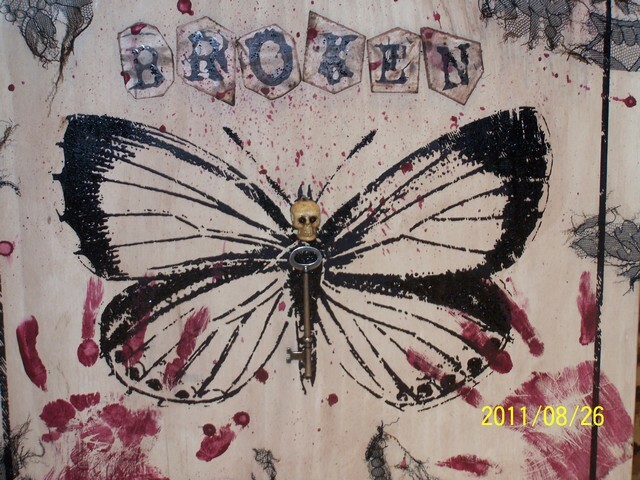 “Broken” has significant meaning to my friend and I. He knows what it means to us. The horror yet beauty of the pieceall speak to being in a place where you are literally broken and “done” and coming out of that place new, clean and with hope. I love you dearly, my friend and am glad to be walking this journey with you by my side.